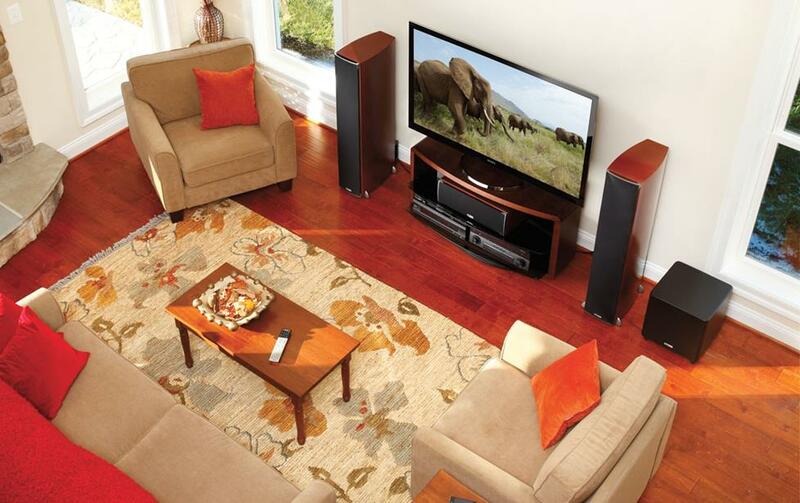 Enjoy room-filling surround sound without wires running all over the floor. Go for a complete 5.1-channel wireless surround sound system from Sonos. Choose a sound bar that can be expanded to 5.1 with wireless surround speakers. Use a home theater receiver that supports wireless surround speakers. Hearing a movie's soundtrack the way the director intended is a powerful part of the home theater experience. But that hasn’t always been easy. Surround sound has traditionally involved a slew of wires and cables running all over the room. Thankfully, new technology has made wireless surround sound a reality! And there are some really cool options available. Sonos wireless music speakers have been customer favorites for years. Now, Sonos has taken their wireless expertise and applied it to their 5.1-channel surround sound system. Check out this short video from Sonos to see how their system works. The centerpiece of the system is the PLAYBAR. It acts as your left-, right-, and center-channel speakers. It also handles all of the system’s audio processing. Simply feed your TV's audio output into the PLAYBAR, and it takes care of signal decoding and wireless audio distribution. Each Sonos speaker has a built-in amplifier, so the only wires are the AC power cords. The intuitive control app turns your phone or tablet into the remote control. The PLAYBAR 5.1 system is available as a complete package, which includes the PLAYBAR, two PLAY:1 surround speakers, and the wireless SUB. This is a great fit for most spaces. However, if you have a large room, or really want to crank your system to “11”, I recommend buying the system à la carte. Pair the PLAYBAR with two PLAY:5 wireless speakers for next-level home theater performance. The newest addition to the Sonos family is the PLAYBASE. It works just like the PLAYBAR, but acts as an amplified speaker platform upon which your TV sits. It's a great option for keeping your system clean and neat if you aren't wall-mounting your television. Build your PLAYBASE system using the wireless Sonos speakers mentioned above, or purchase it as a complete package. You can also use two Sonos ONE speakers as your surround speakers as well. Sonos also offers surround sound systems featuring their latest sound bar, the Sonos Beam. Ready to shop? See all Sonos wireless surround sound systems. 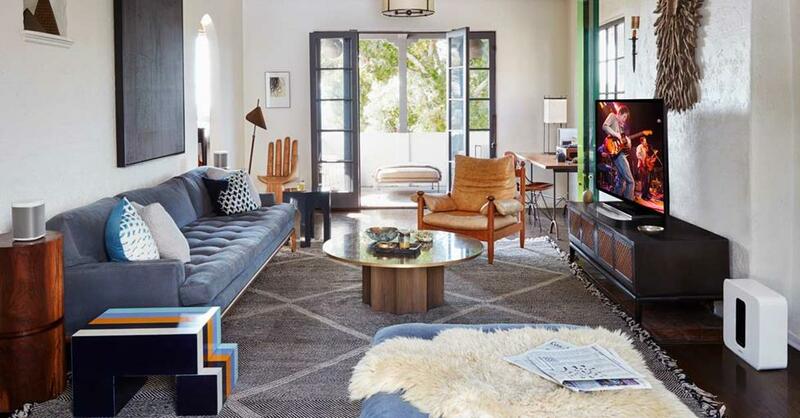 Sound bars have long been a popular way of improving a TV’s front soundstage. 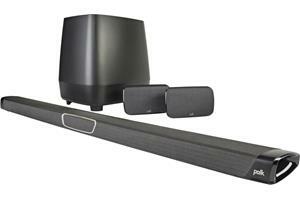 Now, there are lots of sound bars that can be expanded into a 5.1 system with optional wireless rear surround speakers. Some sound bars, like the JBL Bar 5.1 and the Polk Audio MagniFi MAX SR, even come with wireless surround speakers in the box! See all of them. Enjoy an awesome home theater experience without running or hiding any speaker wires or subwoofer cables. 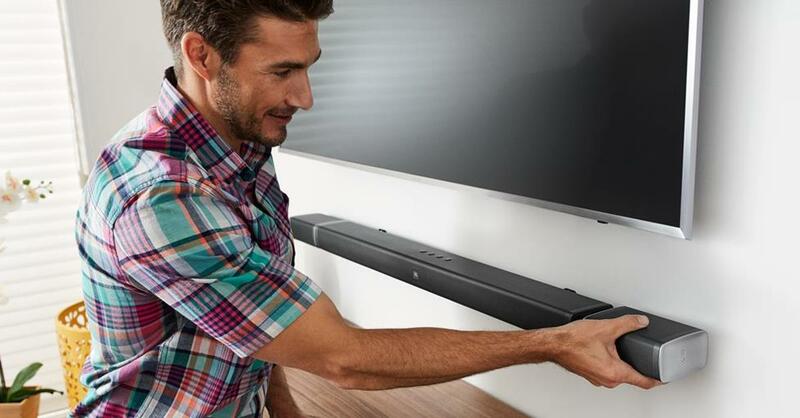 Going the sound bar route gives you some budget and space flexibility. Start your system with a sound bar and wireless sub for improved dialogue, volume range, and bass response. Then when you’re ready to expand your system, add a pair of matching wireless surrounds. They add those crucial special effects that make movies so much fun to watch at home. Some sound bar systems like SONOS and Denon HEOS let you use the wireless surround speakers as standalone music players when you’re not watching TV. Take one into the kitchen while you’re cooking. Or set one up on your porch and stream music from your phone or the internet while you hang out with friends. When you’re ready to fire up a movie or watch a football game, bring the speakers back into the living room and your surround system is ready to rock again. The innovative JBL Bar 5.1 surround system comes with detachable, rechargeable surround sound speakers. Set them up near your couch when you're ready to watch a movie, and plug them back into the sound bar to charge when you're done. Our sound bars buying guide will help you choose the best sound bar for your system. You should know that the term "wireless" refers to signal transmission only (with rare exceptions like the JBL Bar 5.1 system). We can broadcast an audio signal to powered speakers without speaker wire. But, a constant power supply for the equipment is still required. You'll need to plug your "wireless" speakers into an AC power outlet (or a power protection device). For years home theater receivers have required hard-wired connections for surround speakers. Denon has changed this with the HEOS AVR — a 5.1-channel receiver that can broadcast surround information to compatible wireless speakers in the back of your room. Check out our in-depth staff review for a breakdown of all of its features. 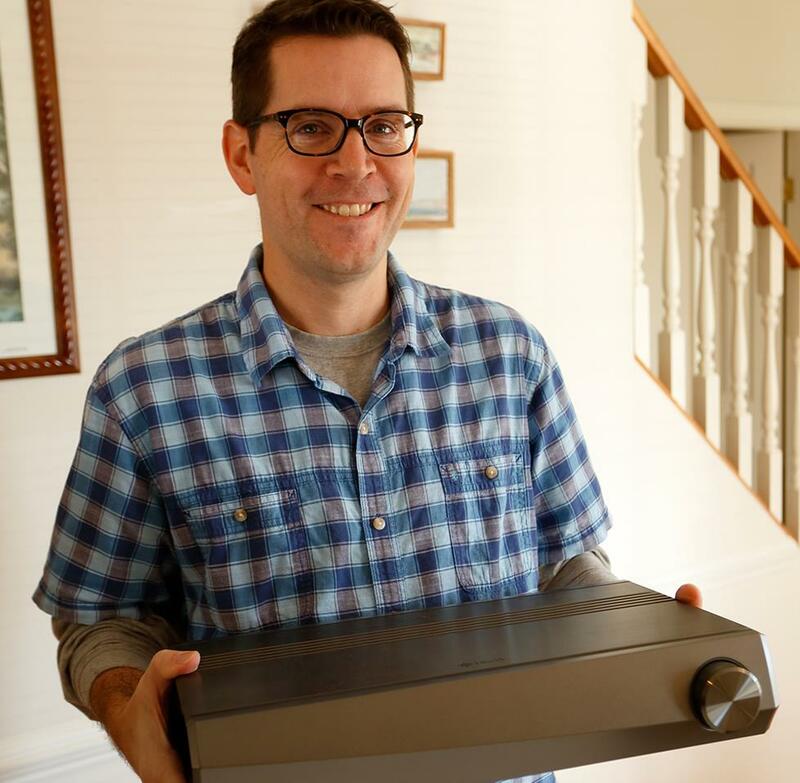 Dave Brown, Crutchfield writer and editor, took the Denon HEOS AVR home for an in-depth, hands-on review. All Wi-Fi equipped Yamaha home theater receivers from 2018 on support wireless surround sound when you add the optional MusicCast 20 or MusicCast 50 speakers. Sometimes our rooms can’t accommodate surround speakers at all. And that’s okay – you can still get great TV sound without wires getting in the way. Here's where a traditional wired system makes sense. Since all of the equipment is in one area, the wires are easily hidden. A 2.1 system combines a pair of bookshelf or floor-standing speakers with a powered subwoofer. This makes for a strong front soundstage for TV and movies, and also a rockin’ stereo music system. Love watching movies? Go with a 3.1 system. This adds a center channel speaker to a 2.1 system for improved dialogue and a wider front soundstage. If you’re going the front soundstage route, I recommend powering your system with a home theater receiver. It handles the audio/video processing and provides amplification for the speakers. And it gives you expansion flexibility should you decide to add surround speakers down the road. Check out our intro to home theater speakers to learn more about choosing speakers. Read our guide to choosing speaker wire to find the right wire for these two systems. Have questions about choosing the right equipment for your surround system? For one-on-one shopping advice, call, email, or chat with us today. Free lifetime tech support is included with your order. Looking to re-do my office setup....primarily for music listening but also TV occasionally......currently Klipsch Synergy B3 bookshelf speakers, Klipsch C1 center channel (which doesn't work with my receiver for music), Klipsch subwoofer, Pioneer VSX 517 receiver. All from 2006-2007 era. Looking to replace all....keep the bookshelf setup, get a nice center channel, subwoofer, upgraded receiver....and looking to add wireless rear speakers that would be wall mounted about 2-3 feet behind me on the wall. Am not interested in a soundbar or anything like that, and would like a receiver with multiple digital outputs for TV and music. I wouldn't have too big of an issue plugging in rear speakers to power outlets. I don't know if higher end wireless speakers exist that I could get the rest of the system from the same company (all my other systems are all the same.....Magnepan, Klipsch, Sony). Any ideas? Hi Matt! Thanks for reaching out — I'm putting you in touch with one of our advisors, who will get a bit more information from you to help design you new system. I have a Denon X3400 receiver and QSC 10" as my front right and front left speaker, a QSC as my subwoofer and klipsch as my center. I would like to wirelessly add surround speakers(Left/right) and possible surround rear(left/right). What speakers do you recommend? I read that Denon has HEOS technology. I heard its similar to Sonos. Would you recommend going this route? Hi Kevin! I'm putting you in touch with one of our Advisors who will help you choose the best options for your system. My question is can you tell me if the Cavelli cv-19 5.1 home theater is as good as the bose home theater system not wireless?? Which would you keep? Hi Edwin, I'm not familiar with Cavelli (it's not a brand we carry), so I'm afraid I don't have any insight into their speaker performance. Hi Oscar, that's right. Your soundbar uses a proprietary wireless technology that is designed to work with the SWA-9000S wireless surround speaker kit. The good news is that it comes with everything you need to complete your system. Hello, I have Samsung soundbar HW-MS6500. I wanted to add wireless surround speakers and a SW, but I was told it only works with Samsung brand speakers. Do you know if that's correct? I am a dental surgeon by profession, having music as my hobby, which is my life, runs in my blood. Most of the weekends I spend my time meeting people whohave dedicated their life for music, music equipements, the sound systems, visiting the adio/video shops where I can find the audio/video units, to study, understand. I am a member of many groups in music, but since I started to go through your articles, your explanations, all extrodinary, very simple to understand and digest even to very beginer in music field. God bless you all people who have dedicated your life for music, as music being a God's gift, which relieves the mind from every tensions, soothing thousands of people at the same time, really music is marvellous. I learnt a lot,a lot, specially in home theater science, right from buying the right units, placing them, matching them, etc, with a great depth and success too. Keep the good work. Congratulate Mr Bill and the entire team for their great success. Hi Matt, an HDMI switcher, like this one from Metra, is ideal for your scenario. It lets you connect up to five HDMI sources to a single HDMI input on on your TV. Hi! I have a Sonos Playbar now and I'm looking to purchase the rest of the 5.1 components. However, my challenge is my Sony TV only has 4 HDMI inputs and I have 5 (minimum) HDMI devices. I've been looking for a Sony receiver to expand my HDMI options, but there is nothing I'm finding that doesn't also include an amp and wired speaker options. I really don't want to drop hundreds on something with all of those features when I just need something to expand my HDMI device count to pass A/V to my TV. Would love to hear what you guys are recommending to customers who are embracing the wireless speaker systems, but have needs that traditional AV receivers offer. Hi David, it's been discontinued by Klipsch and we no longer carry that line. I haven't heard anything about a replacement, but I'm hoping we see something soon — that system rocked. William — I don't believe we currently carry any wireless transmitters that would work for your system. But I'm going to pass along your question to an Advisor, who will reach out to discuss options with you. What happened to the Klipsch HD wireless 5.1 system. Hi Scott, yep — everything will work exactly as you described (no home theater receiver needed). You'll connect your video sources to your TV via HDMI, and then send the audio out to the PLAYBAR via an optical digital cable (it comes with one). Each Sonos speaker in your house can be grouped together (so you could play the TV audio through the entire house). Or, each one can play something totally different. You could certainly have a game going on the TV, and have music play through the rest of your Sonos speakers in your house at the same time. I am considering getting a Sonos wireless surround sound system. I have a couple of questions. 1. I currently get my TV signal through a Tivo box. Currently the TIVO signal goes through a receiver but will I need a receiver if I get the Sonos system or can I just HDMI from the TIVO to the TV and then link up the Sonos system to the TV? 2. Does the Sonos system have the ability to be zoned? For example, if I have guests over and I have music playing on Sonos speakers scattered around the house (including the ones attached to the TV), can I then isolate the TV speakers so I can be watching TV in one room and listening to music in the others? It's good that our living room is surrounded by speakers because we love music and watch movies. it's a bit expensive but watching movies and listening music is surely a different perspective. Hi Steven, I haven't heard the new Polk system yet. But the Klipsch package you're considering is a pretty sweet system, and would work nicely for you. I also like the new JBL Bar 5.1, which has the first completely wireless surround speakers we've ever seen. I recommend checking it out! Hello Mr Crane, I want to spend around $1000 for wireless speaker system, and I don't want to run wire to the rear speakers. I am thinking on "Klipsch RSB-14 + RW1 speakers as rear speaker" or "Polk Audio MagniFi MAX SR". Any suggestion?? MagniFi MAX SR is not released yet, no reviews yet. I skipped Sonos playbar 5.1 since it doesn't come with HDMI and Bluetooth. Hey Randy, you'd be hard-pressed to top the Sonos PLAYBAR 5.1 Home Theater System for what you're looking to do. It's far and away out most popular wireless surround system, and it's super simple to set up and enjoy. Hello Mr. Crane, I want to spend about $1500-$2000 for a wireless speaker system. In other words I want a system where I don't have to run wires to the rear speakers, any suggestions? (By the way I don't mind wires to the bass or receiver) Thanks in advance for any insight! Shane — not currently. Right now the system supports Dolby Pro Logic IIx, Dolby Digital EX, and DTS NEO:6. I'm hopeful that future firmware updates will bring additional format compatibility. Does the Klipsch system support Dolby TrueHD or DTS Master Audio? Hi John, that sounds like a fun project. I'm putting you in touch with one of our advisors, who will help you design the best system for your cabin. Good luck with the reno! I am renovating a mountain cabin (no internet access yet, but I can get decent FW stereo), and Id like to install a mid-level home theater receiver with 2 wireless or wired shelf speakers for hanging , plus a good sub woofer. Ideally I can upgrade this later with surround sound. Any suggestions for the first phase ? Second phase will be satellite internet and 4K big screen. Scott — good catch. I've updated the caption, thanks! Hi Joe, the trick with in-ceiling speakers is that they'll always need a hard-wired power source (whether it's an AC plug to an outlet, or speaker wire to an amplifier). So far, no one has figured out a totally wireless in-ceiling speaker. There are a few different sound bar systems that use rear surround speakers that you can mount to the wall. I'm going to pass along your info to one of our advisors for a recommendation. I want to downsize my 6.1 speaker system. 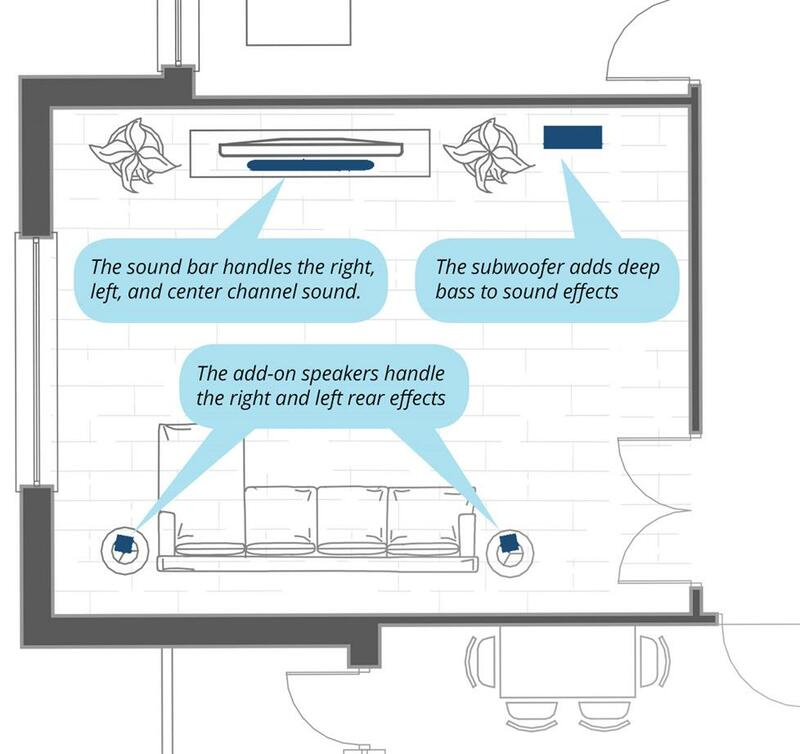 I like the idea of a soundbar with wireless sub, but I would like to add in-ceiling surround speakers. Does anyone do this? Wireless in-ceiling speakers that connect to the soundbar? Thanks. Hi Bob, if your receiver has multi-channel RCA outputs, I recommend the Russound X1-TX8 transmitter to send surround information to the X1-RX220 wireless amplifier. You can then use any surround speakers that you'd like in the back of the room. I have an existing 3.1 setup in my living room and am looking to upgrade to 5.1 and hoping to avoid running speaker wire. Is there a way I can do this without investing in an entire new system? Ideally I'd plug something into two channels on my receiver and then pair speakers to it. Hi Lynn, right now is the perfect point in the home-building process to plan your audio system. I recommend giving our A/V Design team a call. They can help you find the best solution for your home. Good luck with your build! Hi! I am building a home and wonder if it wouldn't be more appropriate to install surround sound now? Does anyone come to the house to design a system? Thank you! Hi Jim, a better receiver will make a world of difference in how your system performs. Indeed, a high-current option like the Yamaha AVENTAGE RX-A1060 will deliver more dynamic sound with better control than your Pioneer. That's no knock on the VSX-820-K, but the Yamaha you mentioned is a high-performance race car that will get the most out of your Klipsch speakers. Yamaha also uses advanced room correction to make sure that speaker distance and room acoustics are properly accounted for. I'd stick with the sub you're using now and focus on the receiver as the next step. Feel free to give us a call if you have any questions! I have a home theater system that is of good quality components but it just doesn't deliver the sound quality I'm looking for. The system consists of a Pioneer VSX-820-K receiver, Klispch Synergy F-2 Towers, Synergy S-2 surrounds (2), Synergy center, and a Velodyne VRP-10 Sub Woofer. Also the BRD is a Sony BDP-S570. The system sounds OK but it seems like I have to push it quite a bit before begins to perform, somewhere around 60% Volume. Any suggestions what I can do to beef it up? I've been thinking more reciever power like the Yamaha 1060, but don't know what else may be a better choicer should I be looking at a different sub-woofer or whatever?